Sebastian Vettel overcame a neck injury to take Ferrari’s first victory at the British Grand Prix since 2008 and extend his lead over Formula One title rival Lewis Hamilton. Hamilton finished second after what turned out to be a thrilling finish and a rollercoaster race for the home crowd favorite, who made a stunning recovery drive from 18th place, albeit with the help of the safety car. The top three cars were extremely closely matched in qualifying. Hamilton set a new lap record for pole position and Vettel just missed out by 0.044 seconds, even though he hadn’t been sure he would even participate in qualifying because of neck pain. Kimi Räikkönen, in the other Ferrari, was just 0.054 seconds behind his teammate, but the order was altogether scrambled at the start of the race when Hamilton made a very slow getaway. 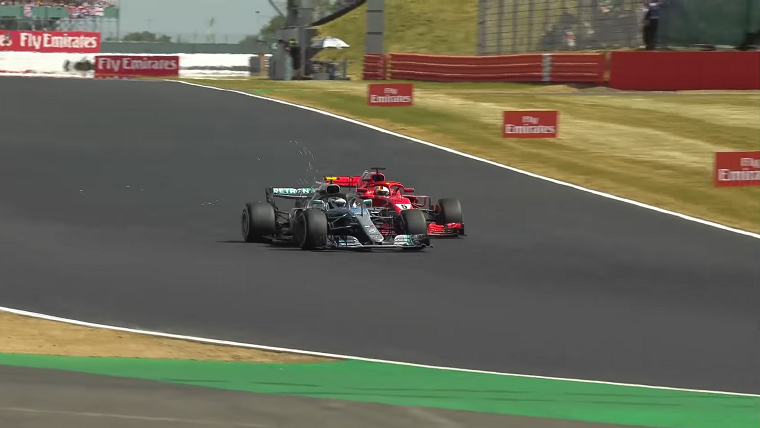 Vettel and Valtteri Bottas promptly got past and as he attempted to do the same, Räikkönen locked up his brakes and bumped into the champion, sending him spinning. Having dropped to 18th place, Hamilton subsequently charged through the field—as Vettel had done at the French Grand Prix—and by lap 10 was already up into sixth place. He would likely have had to settle for a fifth place finish or perhaps fourth had it not been for the safety car, which made two appearances, the first after Marcus Ericsson crashed his Sauber into the barriers and the second after Romain Grosjean and Carlos Sainz Jr collided at high speed. On the restart, Vettel, Hamilton, and then Räikkönen all got past Bottas, who had not pitted for fresh tires under the safety car, but Max Verstappen, who had shown the speed to get onto the podium, was forced to retire because of a gearbox failure. The final safety car period ended with only 11 laps remaining, orchestrating a mad dash to the finish that had Ferrari, Mercedes, and Red Bull all fighting wheel-to-wheel with an intensity we rarely get to witness. But after the race ended, it was clear Mercedes was beginning to show signs of cracking under the pressure. 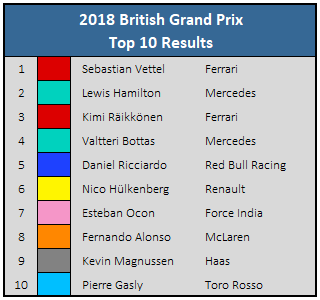 Even outside the team’s three years of total dominance, the British Grand Prix had always been Mercedes’ and Hamilton’s playground. But both have now been beaten at two consecutive races where they would have expected to have an advantage, and while misfortune has played a large role, bad strategy calls and mistakes on the track have not helped. That this has begun to make Mercedes feel destabilized was none more evident than when Hamilton suggested that Ferrari had been employing “tactics”—which was to say “intentionally ramming Mercedes”—to get ahead. Though that should be ignored as the kind of nonsense drivers often spout in the heat of the moment or immediate after-moment, the sentiment was strangely echoed by Mercedes team boss Toto Wolff, who should know better. 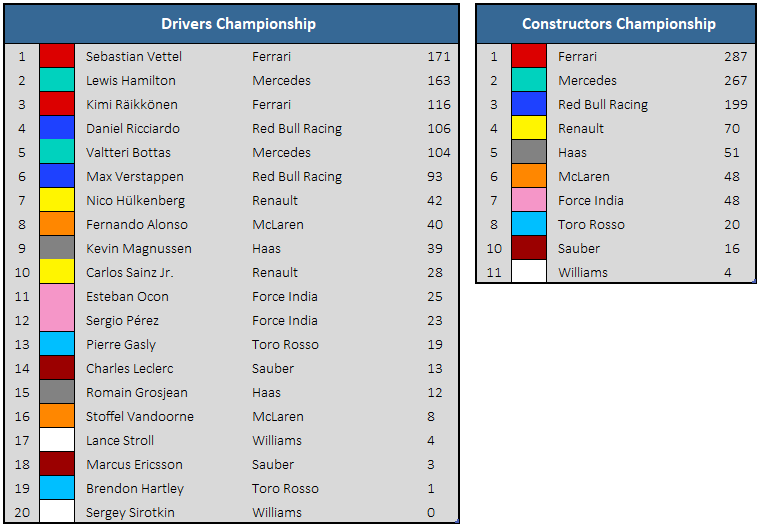 It’s clear that Mercedes is being pushed harder than it ever has in the last four years of competition, and for the first time since 2014, it does not have the lead in the constructor’s championship at this stage of the season. The team, and especially Hamilton after the race, seems rattled. Still, there are 11 races still to go, and plenty of time for Mercedes’ fortune to turn around. And with that, the sport’s first triple header has finally come to a close, ensuring there is no Grand Prix next weekend to clash with the FIFA World Cup final. Stay tuned for the German Grand Prix, which takes will take place the Sunday after next.